In this section we'll look at an automated way of extracting your .gs and .html files to ordinary Drive files so they can be processed by a git client. Let's assume that you want to extract the source for all scripts stored below a particular folder on Drive. In my case, I store all scripts I would want to make public in a folder called "Published Scripts". 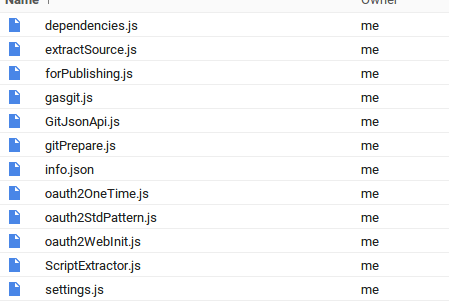 What I want to generate is a folder structure like this, one for each project in the folders and subfolders of Published scripts. In addition, an info.json is created. 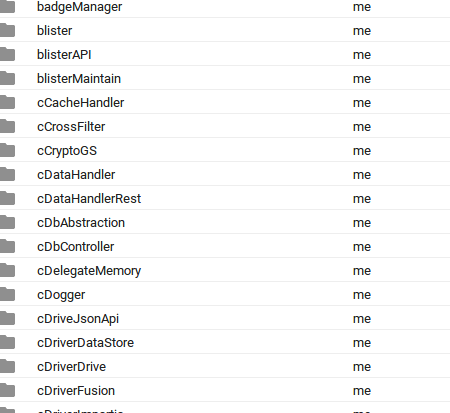 This is used to contain dependency information (for libraries needed - more of that later), as well as information about each of the source files and the last time a snapshot was taken. Each time you run this, it will detect whether there has been a script update (or a referenced library update), and update the directory with the new source (ready to be committed with git). First we need a couple of settings to describe the environment. So in my case I want to find all the scripts in /Published Scripts and create a directory structure for each project in /Extraction/Scripts on my Drive. We'll deal with the dependency setting later on. The main code is fairly straightforward, and shouldn't need any changes. This uses the Drive JSON API for apps script, along with a new class ScriptExtractor, , and again - it shouldn't need any changes.